Hamsters have poor eyesight but a keen sense of smell and good hearing. They are nocturnal and stay active throughout the night. Hamsters’ expandable cheek pouches allow them to carry food and bedding back to their nests where it is pushed out with their front feet. They can stuff an amazing amount of food into their pouches! Read more about rodent wellness care here. The most common pet hamster species are the golden (Syrian) hamster, the Chinese hamster, and the Siberian variety of hamster. Golden hamsters are short haired or long haired (teddy bear), and their fur can be golden brown, cinnamon, creamy white, or a combination of these colors. Chinese hamsters are smaller and usually dark brown in color. The Siberian, or Djungarian, hamster is a dwarf variety with gray fur and a black stripe down its back. Some hamsters are social and like to be housed in pairs, while others prefer to be housed alone. If housed in pairs, it is best to pair hamsters before they reach puberty in order to prevent fighting. Mature female hamsters will fight with other females and males except during breeding. Mature males will fight with other males. Neutering will cut down on aggression and unwanted breeding. Because hamsters like to chew, they must be housed in escape-proof cages. Wood should not be used as a caging material, because hamsters can gnaw through it and escape. Many owners keep their hamsters in wire cages with plastic bottoms or in plastic cages. Adequate ventilation is very important for hamsters, because ammonia from urine can cause respiratory problems. Any cage should be cleaned at least twice a week. Hamsters are natural burrowers, and they commonly burrow in their surroundings. They are also very active and like to explore. Keep this in mind when designing the cage environment for your hamster, which should be large enough to accommodate an exercise wheel, a hide box, and a tunnel for play. A cage with tunnels connecting various sections is ideal. Hamsters need exercise and are capable of running 10 kilometers in a single night on an exercise wheel! A solid surface wheel is best, because broken bones have resulted from hamsters getting their legs caught in wire wheels. Bedding can be shredded paper (avoid shiny ads that can contain toxic substances), hardwood shavings, or composite recycled newspaper pellets. Aspen shavings are free of volatile oils and are another preferred bedding choice for hamsters. In addition, tissue paper, paper towels, facial tissue, old mittens, or socks make excellent nesting materials. Cedar and pine shavings are not recommended, because they contain resins that can be irritating to a hamster’s skin, eyes, and mucous membranes. Water is the number one nutritional requirement for all animals, and the pet hamster should always have fresh, clean water available. A water bottle with a sipper tube works better than a water bowl, which can be tipped over or contaminated with waste and bedding. Hanging the water bottle on the outside of the cage so just the tip of the spout is inside discourages chewing of the sipper tube. Water needs to be changed daily, and the sipper tube should be cleaned weekly. Seeds have a high fat content and poor nutritional balance and so are not recommended as the sole diet for hamsters. We recommend a pelleted diet, such as Oxbow Animal Health Healthy Handfuls, for complete nutrition. Conversion from a seed mixture to an all-pellet diet is usually simple, because hamsters like the taste of the pellets. A gradual conversion is preferred and may take one to two weeks. Pellets can be fed in a sturdy crock bowl. Dishes should be cleaned daily, and any leftover food should be discarded. 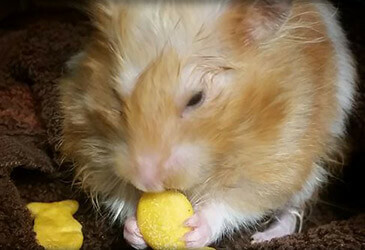 Many owners want to offer treats to their pet hamsters. A treat should be enjoyable to eat and should provide interaction between you and your hamster. Fresh fruits and vegetables fed in limited quantities can be offered as treats. In order to prevent digestive upset, feed the same treats consistently. Diarrhea is not an uncommon problem. The most common causes include bacterial infections (clostridium and campylobacter), parasites (protozoa and tapeworms), and stomach yeast (candida). Vaginal discharge in a sick hamster can be an indication of a uterine infection and warrants a visit to us for advice. Dermatitis and skin diseases are common in hamsters, and the causes include skin mites, bacterial infections, and Cushing’s disease. A skin scraping is an easy diagnostic test performed by us to confirm the presence of mites as seen under the microscope.